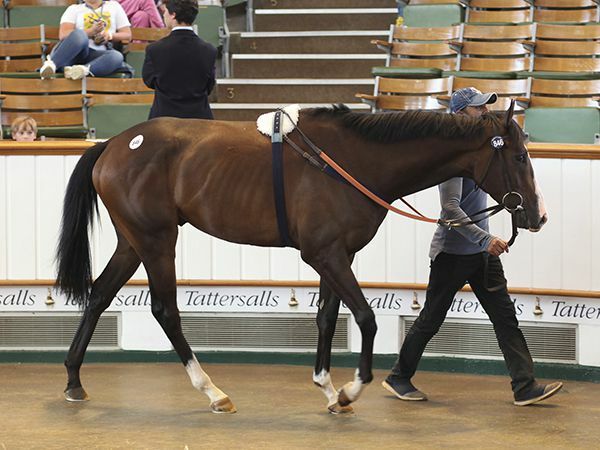 The top lot on the final day of the Tattersalls July Sale came during the evening session when the Qatar Racing owned LETHAL STEPS was knocked down to Margaret O’Toole for 300,000 guineas. The three-year-old son of LETHAL FORCE caught the attention of buyers when he finished fourth in the Listed Sir Henry Cecil Stakes at Newmarket yesterday on his second start for trainer Andrew Balding. "He is for a new client with Gordon to run on the Flat - after all, Gordon is a dual Royal Ascot-winning trainer!" said O'Toole. "Gordon was too busy with runners to be here today, but he saw the horse yesterday and loved him - even after running and vetting, the horse trotted out to his ears." Jamie Railton, consignor for owner Qatar Racing, said: "The horse has been been beautifully produced by Andrew Balding and his team. He ran well yesterday, looking as though he wanted a little further. He has few miles on the clock and is a lovely horse." Lethal Steps is officially rated 99 prior to his run yesterday and has had a mark over 95 throughout his nine-race career - reaching a high of 102 earlier this spring. He finished fifth in the Group 3 Derrinstown Derby Trial in May, before transferring from trainer Ger Lyons to Andrew Balding. The second horse to top six figures on the final day was the Kevin Ryan-trained NEAREST GREEN who has won twice from his only four starts including a week ago at Beverley. The son of EXCEED AND EXCEL is rated 92 by ‘Timeform’ and is heading to Hong Kong, having been purchased by Raymond Tai for 210,000 guineas. Another horse whose owners reaped the rewards of success at Newmarket yesterday was MIDSUMMER KNIGHT who won the Saeed Suhail Handicap for trainer Karl Burke and owner Khalifa Dasmal. The son of DREAM AHEAD ran out a ready winner off a handicap mark of 80 and is set to venture to Qatar after being purchased by trainer Jassim Ghazali for 90,000 guineas. "I have followed this horse for a time, and yesterday's victory made it certain that I would like to buy him. We came particularly for this horse - he will suit Qatar and I like his sire Dream Ahead," said Ghazali. Ghazali has been particularly active at the Tattersalls July Sale this year, signing for 25 lots for a total of 1,294,000 guineas to finish the sale as the leading purchaser. COMRADE IN ARMS is another horse that is headed to Qatar, having been purchased by trainer Debbie Mountain for 72,000 guineas. The Sir Michael Stoute trained son of WAR FRONT won his most recent start at Wolverhampton by six lengths and is rated 86 by ‘Timeform’ following that effort. Irish-based agent Joseph Burke secured the Juddmonte Farms consigned filly BANSURI for 68,000 guineas during the morning session. The daughter of MIZZEN MAST and the Grade 1 Kentucky Oaks winner FLUTE is also a full-sister to the Grade 2 winner and Grade 1-placed FILIMBI. "It is a real live family," said Burke. "Flute is in-foal to Arrogate, while Filimbi has a War Front colt foal and Tapit yearling filly. "She is a really well bred filly, a complete Northern Dancer outcross and I like her physically too. I have been lucky with buying from Juddmonte before - I bought Timeslot here at the December Sale in 2016, and she is now a half-sister to Hofburg, who was third in this year's Grade 1 Belmont Stakes behind Justify. "Bansuri will go to board at Oghill House Stud." “July week in Newmarket is a great showcase for the British and European thoroughbred industry and the combination of quality bloodstock and top class racing is a compelling mix. 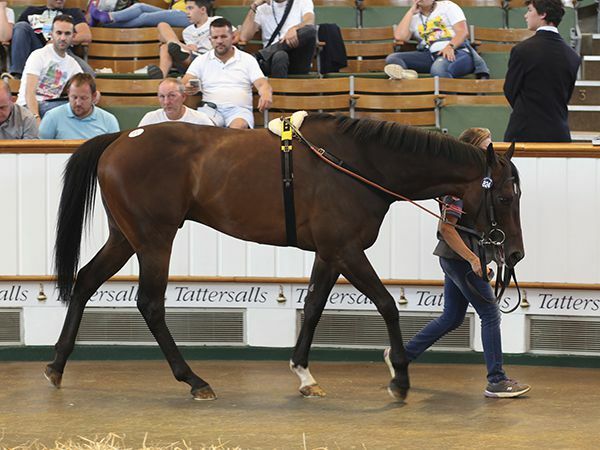 As ever, the Tattersalls July Sale has attracted overseas buyers in huge numbers and we have seen sustained international demand from start to finish of the 2018 renewal. Quality consignments from some of the world’s leading owner/breeders including Godolphin, Juddmonte Farms and Shadwell, have been as sought after as ever and although a handful of late withdrawals took some of the shine off the catalogue, there has been no shortage of competition at all levels of the market. 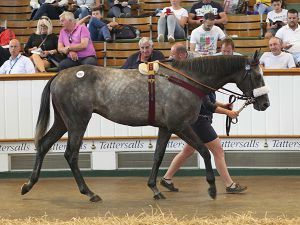 “The clearance rate of almost 90% is the key statistic to take from this week’s sale and the abundance of buyers, both domestic and overseas, reflects the global reputation of the Tattersalls July Sale as a consistent source of both high class horses in training and quality breeding stock. 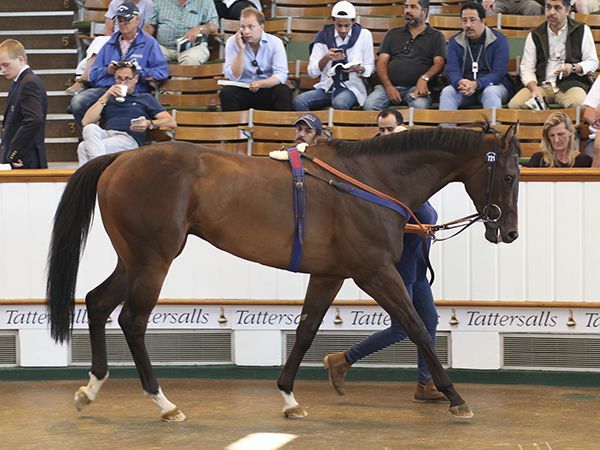 While the individual highlight was the 350,000 guineas sale topping filly AWARD WINNING who set a new record price for a filly at the July Sale, the extraordinary international appetite for horses in training was yet again the most notable feature of Europe’s premier midsummer sale."